Stop, for just a moment, and think about the food on your plate. Have you ever wondered where the food on your plate comes from? Not only the meat, but the kale, lettuce, tomatoes, carrots, and grapes as well? Maybe you’ve seen the big truck on the streets or pulling into the store, where there are boxes of berries or peppers waiting to be organized. The hands that pick your food are often overworked, bruised, and forgotten. A farmworker is someone who works in the fields; many move around the United States, following whatever crop is in season. The invisible hands who pick out fruit and vegetables labor under the hot sun, and can often find themselves in dehumanizing positions where they are denied basic human rights like bathroom breaks and water. Farmworkers are some of the most vulnerable workers/laborers in the United States. Farm work has consistently been one of the most dangerous jobs in this country. Farmworkers work long hours without fair pay, lack the adequate means to protect themselves from the chemicals used as pesticides, which often results in skin conditions and cancers. Their children face isolation. 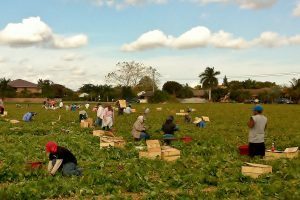 Some cases of modern day slavery, many stemming in Florida, involve farmworkers’ legal identifications being taken away and forced to work under the threat of deportation. The fields are a dangerous place, but they are still a place of resistance and dignity. Throughout the years, farmworkers have gained multiple victories.